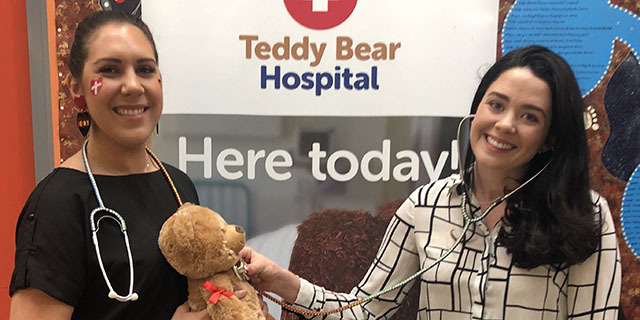 The Faculty of Medicine, Dentistry and Health Sciences held the first Teddy Bear Hospital (TBH) event at the Victorian Aboriginal Health Service (VAHS) on October 2, 2018. Professor Paul Monagle and Linda Browne from the Melbourne Medical School (MMS), Department of Paediatrics, supported more than 40 University of Melbourne (UoM) students from every clinical discipline, who volunteered to engage in a play-based communication activity with 45 primarily pre-school​ aged children. The aim of the visit was to alleviate the children's and families' anxiety associated with a clinical setting and personnel, while providing an authentic learning opportunity for students in relation to factors pertaining to the health of Aboriginal and Torres Strait Islander people. Running dental stations in the dental clinic, teddy doctors in the consulting rooms and optometry in the optometry rooms, enabled the children to become familar with the healthcare environment at VAHS, while the students were able to see the comprehensive nature of an Aboriginal Community Controlled Health Organisation (ACCHO). On the eve of the event, students were provided with a tailored cultural safety session provided by UoM Indigenous health academics Shawana Andrews, School of Health Sciences and Dr Ngaree Blow from the MMS, Department of Medical Education. Through their subsequent engagement with the children, students had the opportunity to immediately apply the cultural safety concepts and lessons including developing their understanding of the importance of community relationships within VAHS, as well as common clinical issues pertaining to managing and communicating with different children in quick succession. The teaching and learning activities were scaffolded on the day by a number of Indigenous health practitioners including Shawana Andrews and MMS alumni Dr Ngaree Blow and Dr Jordan Cory (pictured). Feedback from VAHS staff was very positive, including identifying the benefits for the children in seeing young adults from their own community as future doctors, speech pathologists, physiotherapists and other health practitioners. The TBH visit was also identified as having the potential to encourage children to attend the recommended annual Aboriginal and Torres Strait Islander Health Check (item 715), which has been a strategic focus for VAHS, in their partnership with the "Deadly Choices" program. The feedback from the VAHS community was very encouraging, with positive comments and posts in social media, as well as invitations for TBH to visit other ACCHOs around the state. Congratulations and thanks to the UoM student volunteers, as well as VAHS and UoM staff, especially those who donated their time to support the event.